Former African Union (AU) Commission chairperson and South Africa's Minister in the Presidency Dr Nkosazana Dlamini-Zuma has expressed confidence that Zimbabwe will soon turn the tide and become the regional powerhouse it has always been. In an interview on the sidelines of the Forbes Woman Africa — Leading Women Summit here on Friday, Dr Dlamini-Zuma said Zimbabwe was richly endowed with human and natural resources which could be leveraged to transform the economy, adding Government efforts would soon bear fruit. "The Zimbabweans have certain advantages. They are educated and the quality of the education is excellent. Zimbabwe has all sorts of minerals, so if you put all these together — the skills and the mineral resources — you have a good combination to revive the economy. "Zimbabwe will certainly turn the corner soon," she said. Dr Dlamini-Zuma said it was critical that infrastructure such as roads and energy be revamped to allow for a more robust transformation process. It was also important that Zimbabweans work together in rebuilding the country. Her voice adds to those that have registered a vote of confidence to the recovery and growth trajectory initiated by President Emmerson Mnangagwa and his team under the Transitional Stabilisation Programme (TSP) launched last year. The country endeavours to become an upper middle-income economy by 2030. "Zimbabweans are a resilient people. The country will be a big contributor to Sadc. The people of Zimbabwe all need to work together to ensure that they transform their country," she said. Her sentiments also come ahead of the Zimbabwe-South Africa Bi-National Council Summit on Tuesday, during which the two countries will sign new agreements and review existing ones to take their relationship to a new level. Preparatory meetings are already underway. South African President Cyril Ramaphosa is expected in the country tomorrow. Dr Dlamini-Zuma said Zimbabwean women, who make up 52 percent of the population, had a critical role to play in restoring the economy. "Zimbabwean women are educated, strong and determined. They must just make sure that the strength is utilised for their benefit and that of their families and country. "Women, where they participate, they multi-task, in corporates . . . at the top. They become very competitive. They use 70 percent of their income for family as opposed to men who use just 30 percent of theirs for family." Zimbabwean women and those in other developing countries have rescued their families and countries in times of great need by engaging in projects such as cross-border trading. Women's entrepreneurial skills have been identified as critical to Zimbabwe's growth and development. The African Union Avenue 2063 – launched under the leadership Dr Dlamini-Zuma — also emphasises the role of women in Africa's socio-economic development. 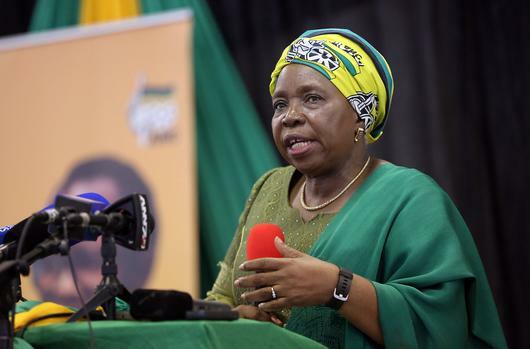 Dr Dlamini-Zuma, who made a strong showing in contesting for the ANC presidency, said it was also critical for African women to participate in politics to foster development. "It's important that women participate meaningfully in the politics of their respective countries. They need to be encouraged and it must be the responsibility not just of women alone, but men too, to encourage the women. "We should not just be voters but we must vote and be voted into power too." The Forbes Woman Africa-Leading Women Summit ended here on Friday with renewed hope and commitment that African women would lead in developing new ways of creating wealth. About 500 women leaders, scientists, chief executive officers, medical doctors, women from the academia, the media and many others from across the continent convened in South Africa's third-largest city.